The bike lane: as far as infrastructure goes, it doesn't get much simpler. It's just a matter of splashing some paint down on the asphalt, right? Unfortunately, there's a whole set of laws, red tape, and bureaucracy that keeps cities like Oakland from adapting and adding more bike and pedestrian-friendly infrastructure. Perversely, the biggest obstacle is California's landmark environmental law, The California Environmental Quality Act, better known as CEQA. The East Bay Express recently chronicled how CEQA gives opponents of urban infill a weapon to block all new development projects, even if they are environmentally friendly. Similarly, CEQA is a roadblock (get it?) for adding bike lanes. The way it works is this: if a street has to be significantly altered in order to add a bike lane, that will trigger an Environmental Impact Report. The EIR studies only the effect of the reduced vehicle lanes on congestion. (Not, say, how many people will bike instead of drive as a result of the new bike lane.) A "Level of Service" (LOS) analysis has to be conducted, giving the streets a grade from A to F. It conducts this level of service not just for the present day, but for 30 years from now, to make sure there won't be massive congestion in the future. These future projections assume that traffic is going to double or triple in the future. This assumption becomes a catch-22: people will drive because they don't have the option of biking safely, and we don't add bike lanes because there will be too many drivers. The crush of traffic on West MacArthur at 5 pm on a weekday. To deal with the EIR bureaucratic mess, workarounds are constructed. For example, the bike lane on 27th Street becomes a sharrow lane as it approaches Broadway--this is a "mitigating effect" for traffic flow. The irony is that bikers are less protected just as they reach a busy intersection. Fortunately, the EIR process is just about disclosure. Our city council could say that they don't care about the imagined congestion and build the damn bike lane anyway. (In technical terms, they can file a "statement of overriding consideration.") But people tend to freak out when they hear the word congestion. Nobody likes traffic jams or road rage, and city councilmembers don't want to be blamed for causing it. (I can picture the mailers now: "Councilmember so-and-so is responsible for the huge traffic jam on West MacArthur. Vote her out of office!") So the status quo remains in place. Jason Patton is the Bicycle & Pedestrian Facilities Program Manager at the City of Oakland. He knows firsthand the frustrations of this process, and his department works to increase bicycle infrastructure despite these obstacles. (Full disclosure: I've been volunteering for him at his office.) I was recently able to pick his brain regarding the finer points of CEQA, traffic projections, and more. OaklandStreets: Are the assumptions for the future traffic calculations flawed? Jason Patton: “Flawed” is a loaded term, so let’s think instead in terms of the model’s purpose and how well it achieves its purpose. It is intended to be a countywide travel demand model for the purpose of planning and evaluating major transportation investments (like new freeway interchanges or HOV lanes). In practice, it gets used for evaluating local development projects. There is a basic disconnect here. A demand model is trying to get a sense of how much “demand” there is in the abstract for the purposes of planning long-term investment. But people’s behaviors are shaped more immediately by the relative cost and convenience of various options. If roads are congested, people will choose to drive less because it’s not as practical, but there is still “demand.” Also, the model is not intended to capture the outcomes of macroeconomic factors, demographic changes, or policies. For example, energy costs are going up, younger generations are driving less, and climate change policies mandate reductions in vehicle miles traveled (VMT). But the demand model predicts increasing VMT. OS: Bikes seem to account for only a small fraction of traffic on most streets in Oakland. Is it true in practice that a bike lane increases vehicle congestion? 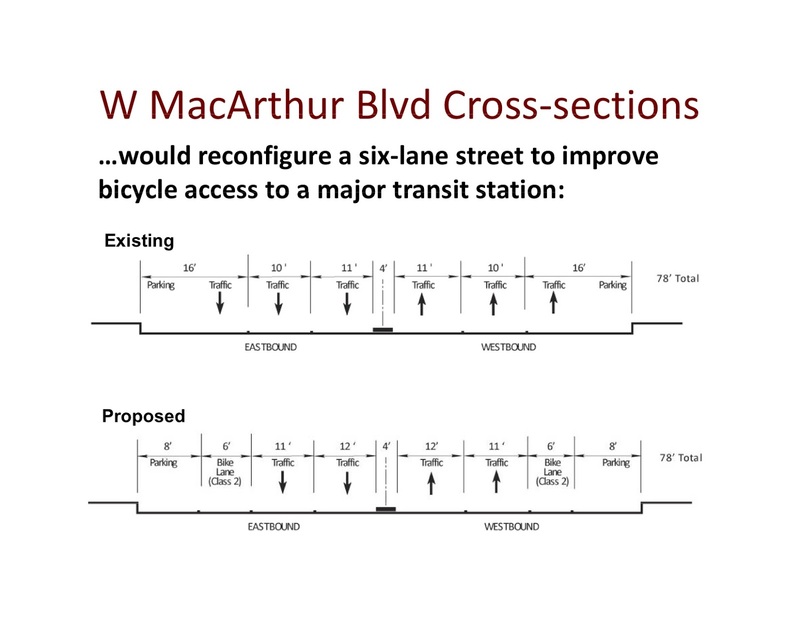 How much would ridership have to increase for bicycles to reduce vehicle congestion? JP: At some Oakland intersections, bicyclists are up to 20% of roadway users in the evening commute. Citywide, 3% of workers use bicycles as their primary means of transportation to work. (This does not include people who bike to BART.) A bike lane could increase vehicle congestion if the installation of that bike lane requires the removal of a vehicle lane when the use of the vehicle lane is high and the use of the bike lane is low. In other instances, a bike lane could decrease vehicle congestion by getting people to shift modes, or at least by separating bicyclists for cars. Imagine the congestion of driving your car in a single lane where you have to change lanes to pass a bicyclist every minute. In this instance, a bike lane would certainly reduce congestion. OS: Is the approval process this difficult everywhere, or is this bottleneck unique to California/the Bay Area? JP: The issues are distinct to California because of how the California Environmental Quality Act requires an analysis of transportation impacts under cumulative conditions (i.e., with a future forecast of traffic volumes). There may be similar issues in other states, but it’s not a national problem and it’s not limited to the Bay Area. OS: "Multimodal Level of Service" analyses are emerging as a means of taking pedestrian and bike traffic into account when designing streets. What would it take for this to become standard within Oakland? JP: MMLOS should not become the standard in environmental review because it would effectively replicate the problems with vehicle LOS for all modes. The environmental impacts of motor vehicles should be measured based on vehicle miles traveled or vehicle trips generated. Bicycle trips on paved streets do not create environmental impacts. Thus, no analysis is needed. Separate from environmental review, MMLOS could be used to evaluate design alternatives or weigh tradeoffs between different modes. But as a tool, MMLOS isn’t there yet in providing reliable results that match professional understanding. JP: The problem is the confluence of four factors, each of which is overseen by a different governing body. State lawmakers are responsible for state environmental law. ABAG is responsible for growth forecasts in the Bay Area. The countywide congestion management agencies are responsible for the transportation models. And local jurisdictions are responsible for setting thresholds of significance under CEQA. Change could happen at any or all levels, although practically changes at the state level in light of AB32 and SB375 would speak most directly to the issue. OS: What difference does public support and engagement on this issue make? JP: CEQA is fundamentally a disclosure process – to provide information to a decision-making process. For a particular project, the process may show traffic congestion in the future. One source of this congestion is the future year traffic forecasts. But the public and decision-makers get nervous about congestion, so this disclosure of future congestion can catalyze opposition to the project under study. People should know that roadways are being designed today to accommodate drivers who have not yet been born. In some instances, these decisions are at the expense of bicyclists and pedestrians using those streets today. OS: You've told me that EIRs measure change from the status quo, for better and for worse. Do you think there should be a different guiding principle in measuring environmental impact? Should a different set of standards be applied for cities vs. rural areas? JP: I’m not enough of a CEQA person to say, although there have been plenty of attempts to create CEQA exemptions for in-fill projects. But for reasons beyond my experience, they don’t seem to have solidified into a standard practice that addresses the root of the issue: why is driver delay at a traffic signal a potential environmental impact? Due to engine technologies, carbon monoxide hot spots stopped being an issue in the 1970s. Driver delay is a matter of convenience, and as such it’s a social issue. Policymakers can choose to address driver convenience, but let’s not call it an environmental impact. The coolest possible use of two consecutive parking spaces. Good job, Oakland. Q. How do you determine which streets are going to be paved? A. It’s much cheaper to preserve a street by resurfacing it than it is to rebuild a damaged street ($20 per square yard to resurface vs. $140 per square yard to reconstruct). So for the same amount of money we can raise the condition of one city block from Poor to Excellent (pavement reconstruction), or we can improve seven city blocks from Fair to Excellent (pavement preservation). For this reason, we spend 80% of our scarce resources on Fair streets and only 20% on Poor streets. Preserving what we have must continue until additional paving money becomes available. Q. Why isn’t there enough money for street maintenance? A. In part, improvements in fuel efficiency have led to lower gas tax revenue for cities. For example, in 1993, cars averaged 10 miles per gallon and the Gas Tax was $0.18 per gallon. Today, cars get 30 miles per gallon, yet the Gas Tax is still $0.18 per gallon. As a result, we’re driving more and paying less. It's quite a feedback loop--the greater the fuel efficiency of cars, the less money we have for infrastructure. What happens when fuel efficiency doubles, as it's supposed to by 2025? Will we double or quadruple the gas tax to make up the difference? That seems unlikely. According to the sheet, the backlog of maintenance work needed is currently approaching half a billion dollars. (For perspective, the total annual budget of Oakland is about a billion dollars, of which about five million goes towards street maintenance.) What are the long-term ramifications of this deficit? What happens when our streets continue to fall apart faster than we can rebuild them? People (well, some people) have been complaining for years that the externalities of driving--pollution, climate change, infrastructure costs, etc.--are unfairly subsidized by the general public. At some point, will the costs associated with driving become prohibitively expensive? What happens then? Clearly, something's gotta give. With this whole new urbanism thing, bikes are taking their place more and more in the city landscape. 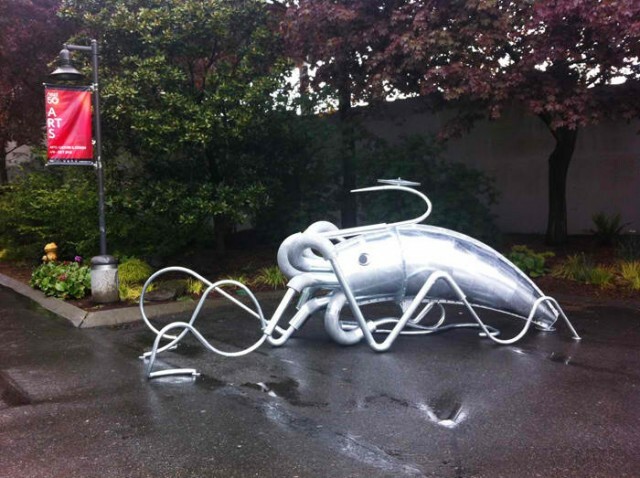 One nice thing about that is that, unlike car parking lots, bike racks take up little space, can be installed inexpensively, and even provide an opportunity for public art. Other cities seem to be way ahead of Oakland in this department. San Francisco has an artist-designed bike rack program. They also have some new bike racks/micro parks (or whatever they're called) that look cool. They cut out into the street and even have seating for sipping one's latte after yoga class, or whatever it is one does in San Francisco. Thanks to all the old parking meters, Oakland has no shortage of places to lock up bikes. Still it's kinda lame that even Emeryville has artist-designed bike racks and Oakland doesn't. I recently visited Long Beach, and was impressed with all the creative racks that have been installed. The City of Long Beach is pleased to offer a free bike rack program to provide secure bike parking throughout the community as part of our ongoing effort to be a bicycle friendly city. Man, it doesn't get much easier than that. (Click on the link to see the full range of styles.) It costs the government about $300 to install a rack. Not bad for something that's useful, durable, and nice to look at. New York, Seattle, Portland and even Toledo, Ohio have similar programs. On the other hand, while Oakland may have fewer artist-designed bike racks than Toledo, Nashville, or Long Beach, ours actually get used. And that's what really matters, right? This is Oakland in 2012: A line out the door by a torn-up street every Sunday afternoon for salsa dancing and Cuban food at Caña. I never could have imagined this five years ago. Sometimes change is good. 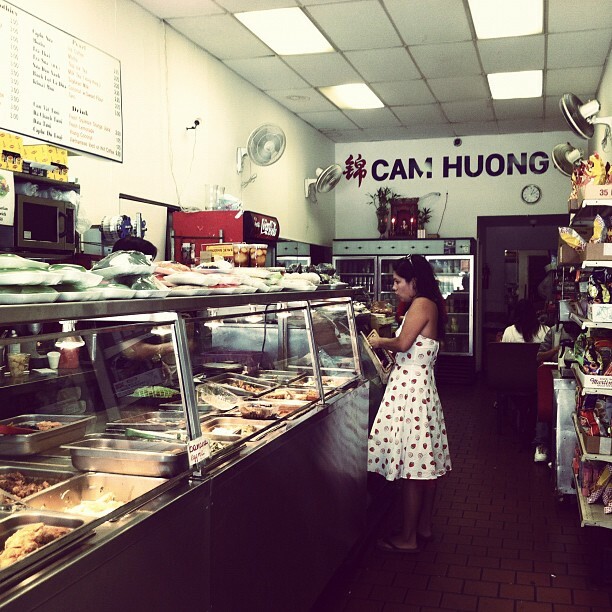 Another reason to love Oakland: Cam Huong, on 9th and Webster, still sells Vietnamese sandwiches for under $3.00. I took a trip to Chicago recently. I was curious to check it out, because I had read various things about how the former Mayor, Richard Daley, had revitalized the city by going green. Our hosts in Chicago told us all about the Green Exchange, a lamp factory-turned green economy hub. And green roofs were visible from the Hancock Observatory. Apart from these brochure-ready projects, there were some real changes to the city landscape. First of all, there were hellla trees, many of them young saplings still filling out. It definitely softened the "concrete jungle" image I had of Chicago. 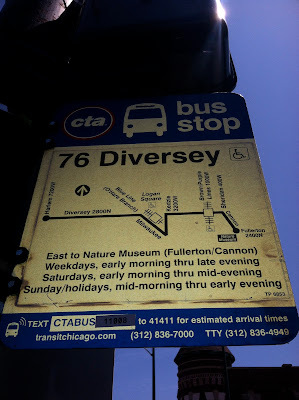 Apart from that, Chicago had some nice things going for it that made the city more liveable and more functional. Oakland could stand to learn a few things. I'm not talking about skyscrapers and massive public works that only a big city can take on, I'm talking about little things. 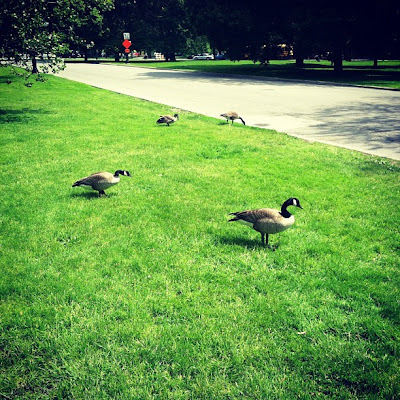 Things like a conspicuous lack of goose poop. 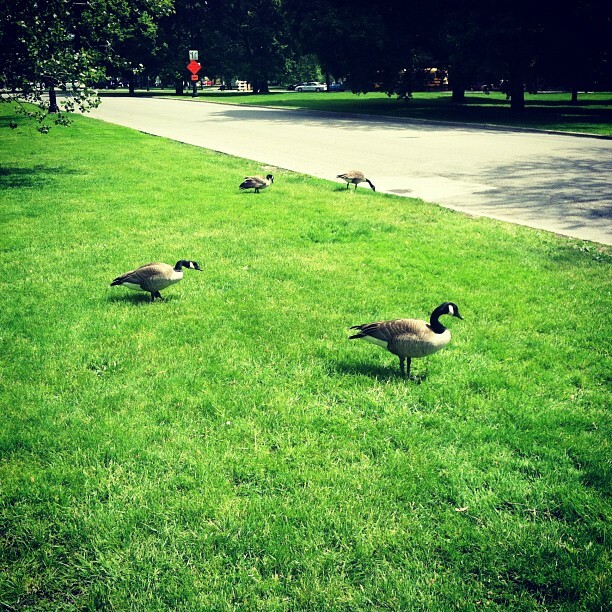 Yes, Chicago has Canadian geese just like Oakland. But unlike at Lake Merritt, the park actually puts up "don't feed the wildlife" signs. Between that and the subzero winters, the goose population seems to stay at a manageable level. You could actually imagine yourself sitting down on the grass! Who do I have to lobby to get a sign like this put up in Oakland? 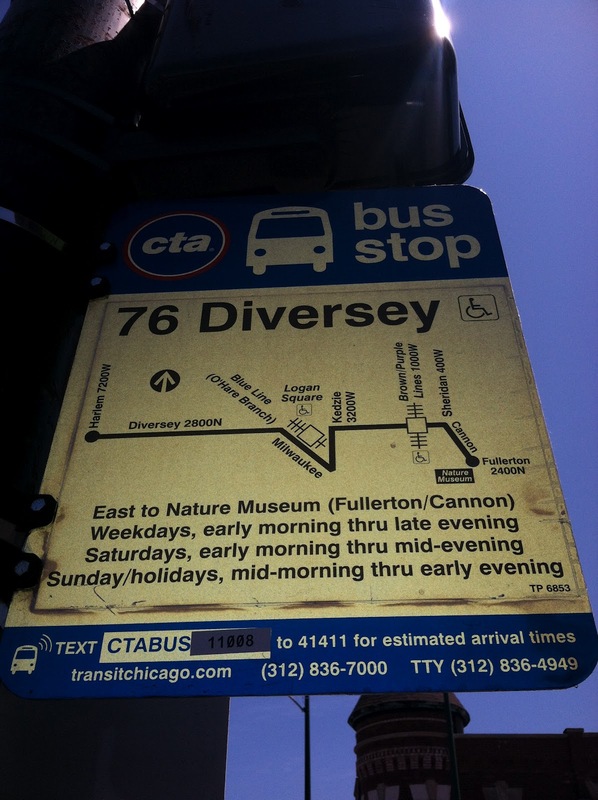 A nice detail that made getting around easier: each bus stop has a unique code that you can text to a transit authority number. You get an instant response back that tells you how many minutes away the next bus is. And it's actually accurate! I used this feature approximately one hundred million times on my trip. It's amazing how much better the whole bus-riding experience becomes when you're given a little more information (and therefore control) over the process. It's a simple, cheap innovation that doesn't require smartphones or electronic billboards. And then there's Millennium Park. I've devoted a blog post or two about public works in Oakland that were constructed at immense cost, yet are either irrelevant or actively harmful to the life of the city (Jack London Square, Middle Harbor Shoreline Park, West Oakland BART, etc.) Millennium Park once appeared to be doomed to a similar fate. It was built way behind schedule, with massive cost overruns. But nobody cares about that now, because it turned out to be a huge, transformational success. I'm not quite sure what the lesson to be learned here is, but it's something like: if you're going to blow a whole bunch of money on a massive public works project, you damn sure better knock it out of the park. So to speak. How Dangerous Is Oakland? Is It Dangerous To Live In Oakland?